I was running errands this past Thursday and I glanced down at my dashboard thermostat – 85 degrees! In north Georgia, I think winter just kind of skipped us altogether (we didn’t make a fire in the fireplace a single time :/) and I’m over it. I’ve held onto faux pine branches but it just doesn’t feel right in flip flop weather so I’m moving on to all the pretty, fresh hues. The blue and white decor that was put away for Christmas has been brought back out and with each bedroom update or room textile refresh, I’m finding more and more spaces are getting decked in my favorite color palette — something I picked up from my grandmother, and then my mom. It’s classic, it’s coastal, and it’s an easy way to blend eclectic styles together. 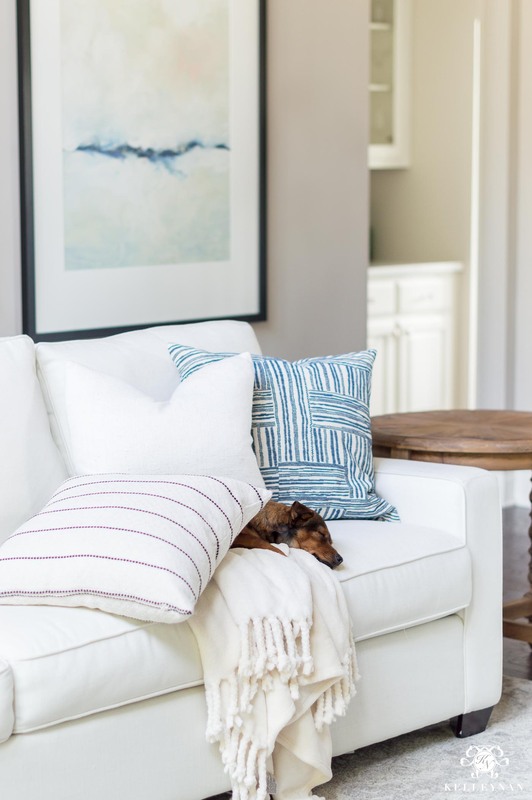 Whether you just want to dip your toe in with a small intro of blue and white, or are already fully committed, today I’m rounding up a few favorites from home to fashion, from decor to organization, in addition to sharing some blue and white moments in my own home. At $36.99, THIS sweet little brass, blue and white owl lamp is a precious steal! And, if you’re looking for storage for your office, kid’s room, cabinet, or closet, THESE rope storage bins are under $20; I actually just grabbed a couple of THESE for the nursery last week. I’m asked often where I find my blue and white jars (everywhere) but they can get pretty expensive; THESE 8″ jars are only $35. We haven’t started back on the powder room just yet (I think I may have tossed to many balls at once and I’m waiting for them to all fall haha) but I am mulling over which direction I want to go with the wallpaper. (I did get THIS mirror in gold a few months ago so it’s the only strong commitment thus far, aside from the wall trim we added when we did the kitchen.) I LOVE the direction of THIS blue and white floral wallpaper, though. And, speaking of “kitchen”, I considered a version of THESE stools before ultimately going with the rope style I ended up with. They do come in both counter and bar height, in four different color combos 😉 *You can get them right now for 20% off with code ENTERTAINING HERE. Coincidentally though, it was my love of these stools that led me to springing for the bed (HERE) I just purchased for Mama Nan’s room (which by the way, is still on mega sale 😉 ). My living room feels best when it’s dressed in a little blue and white and THESE pillows have made their way around multiple rooms in the house over the past year. The art you see in the background (HERE) is huge and took this sad blank wall up about 10 notches when we hung it. I went for the 40″x54″ but it comes in seven sizes, all the way down to a 5″x7″, matted or un-matted, and in almost 20 different frame options. 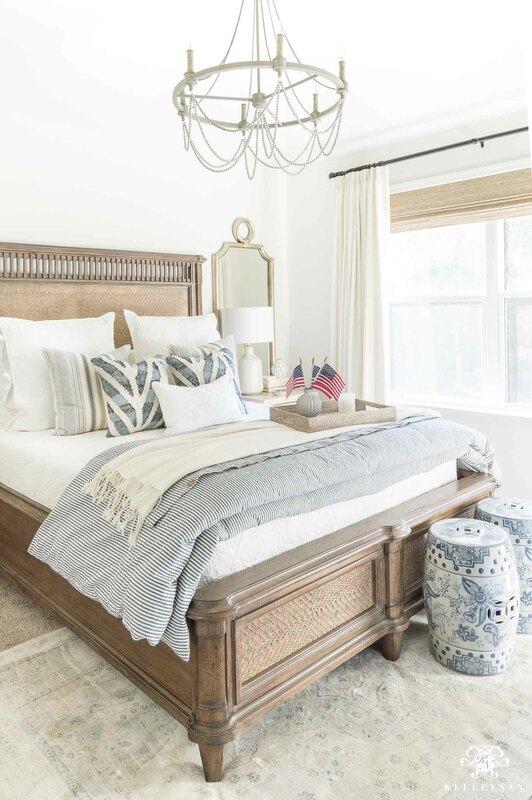 The first room I committed to blue and white (while still leaving it fairly easy to switch up color palettes) was the blue and white guest bedroom. 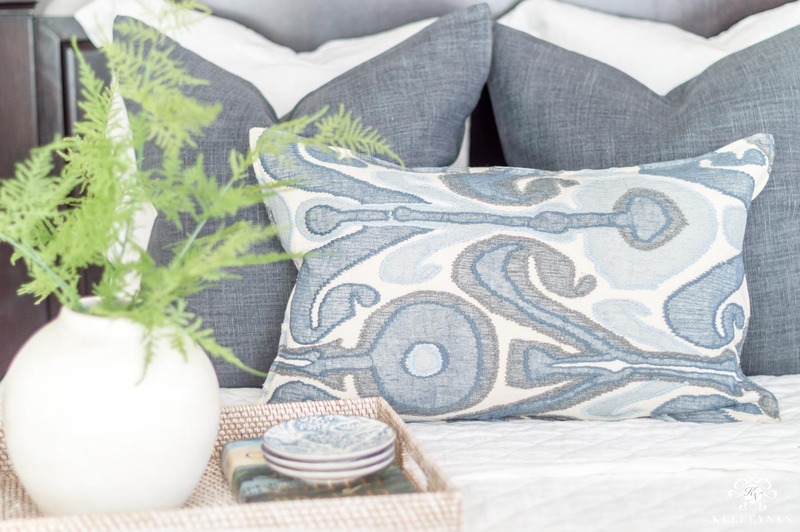 THESE indoor/outdoor geometric blue and white pillows remind me of the throw pillows on this bed that went out of stock a while ago (just at a fraction of the cost 😉 ). The striped duvet cover actually comes in a couple of other colors. Starting this weekend, I’ll be shifting from blue and white to all things green in celebration and preparation for St. Patrick’s Day. 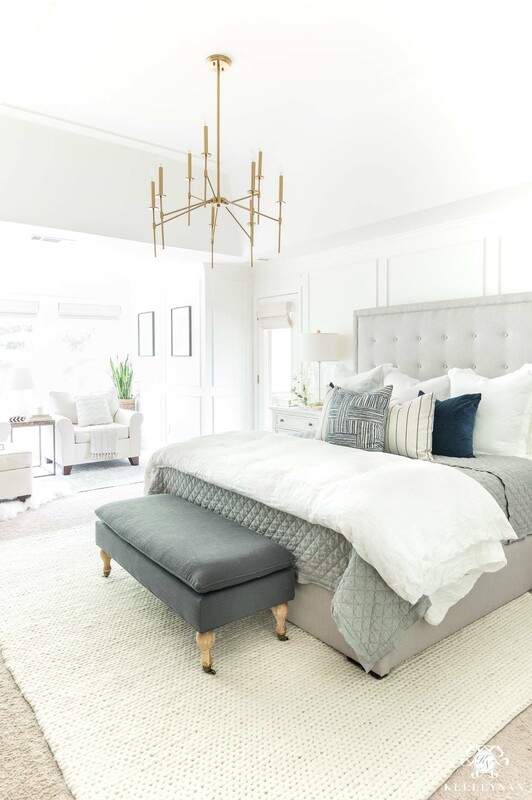 Subscribe to receive emails at the bottom of the post and catch all the upcoming entertaining ideas, room makeovers, and even a few personal things I’ll be sharing ;). I luvvvv blue and white. Can’t quite embrace the gray phenom. So many super choices. Your decorating style is amazing!!! We have not had many days cold enough to wear all my sweaters that I love because it’s been such a mild winter in South Georgia. I’m afraid the pecans won’t produce and after the hurricane we lost so many pecan trees. Love Blue Willow and Blue onion patterns for my dinner table. I have to like it—-I inherited a truck load from my mother and my siblings didn’t want any of it. Blue works in any decor! I adore blue and white. 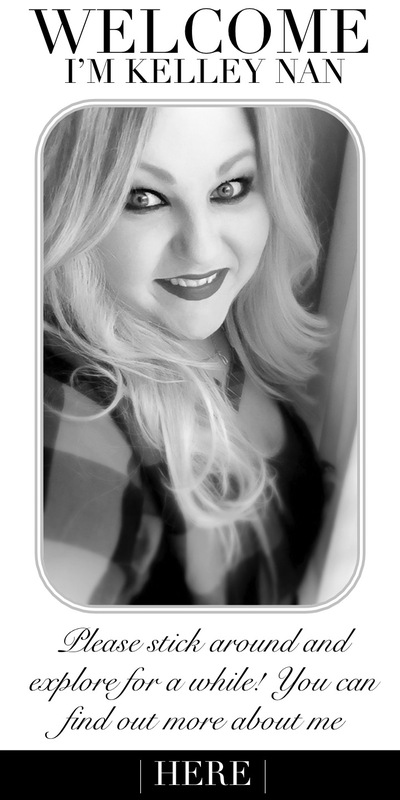 If you are not familiar with The enchanted Home blog. Check it out. Thanks for this post. Best of luck with the adoption. Judy, I’m not! Thank you for sharing! 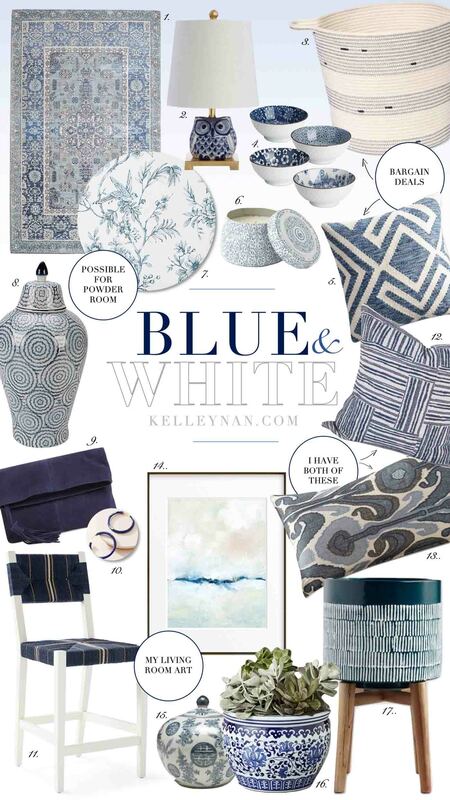 Love all of your selections, Kelley! Especially love your picture of your sweet furry baby! You “do” blue and white like no other! The selections you have picked are simply superb. I would love to find a home for that lil owl lamp. I have decided every room needs an animal of some sort. Haha… Bebe would be so proud. I love this post! Hi Kelley. I am really wondering and I have not thought earlier that blue and white could be such beautiful. The images charmed my eyes more and more whenever I see this. Thank you for sharing such a wonderful article.